Even though these first days of March have not been balmy, Peregrine falcons are on the move. I have a report of Rebecca and Kewpee successfully defending their territory from another falcon, probably a male. The skirmish was quick, and all seemed fine a short time later. 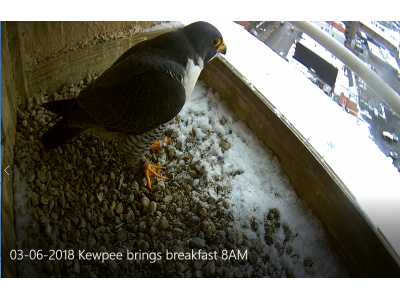 I saw Kewpee fly in with dinner for Rebecca after the intruding third falcon left. I also had an eye-witness report of mating. For the last two years, the first egg was laid on March 19. With the cold temperatures we are experiencing this week, I certainly hope that egg laying will not occur just yet. Kewpee continues to demonstrate that he is a good provider. You can see a food exchange between him and Rebecca in the video clip from 03-06-2018. Stay tuned.